Link Up Your Diverse Children's Book Posts There's still time to linkup books for children that showcase the diversity of our world. New Book Alert: The Seventh Wish by Kate Messner. I love Kate Messner's books. Here she tackles an important topic (and one that has already gotten her "uninvited" to a school visit on the day the book debuted). #3rdfor3rd: If You Like the Lightning Thief... find out what you should read next! Congratulations to George. Winner of the 2016 "Lammy" for Children's and Young Adult Literature. 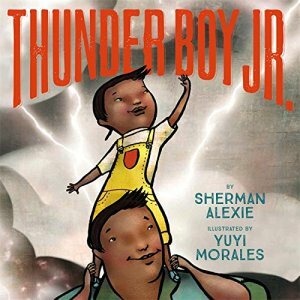 Thunder Boy, Jr. (2016) by Sherman Alexie and illustrated by Yuyi Morales. There has been a lot of hype, praise (recently named a Boston Globe-Horn Book Honor book), and critical discussion about this book, so I was very interested in seeing it for myself. Overall, I have to come down on the side of ... ambivalent. I love that it is a story about a modern-day Native American family and the relationship between a father and his son. But I also immediately see all of the concerns others have raised about the importance of names and naming in Native American culture (for more on that, please read Towards a Common Understanding of Native Peoples in the U.S. (or, Why Alexie's THUNDER BOY JR. Needs a Note to Readers)) and, for me, the story just doesn't quite work. A book like Kevin Henkes' Chrysanthemum seems like a deeper treatment of unusual names and learning to be comfortable with yourself. Whoosh! Lonnie Johnson's Super-Soaking Stream of Inventions (2016) by Chris Barton and illustrated by Dan Tate. I love this new nonfiction biography of Lonnie Johnson, and I wish it had been published before my kids started their Passion Projects this spring. The book does a great job of connecting Lonnie's interests as a kid to his future plans, as well as showing the ups and downs of a real career. Definitely a book I will use with kids in the future! Hour of the Bees (2016) by Lindsay Eager. I thoroughly enjoyed this wonderful debut novel. I had heard good things about it before but what finally caught my eye was a review last week that mentioned the phrase "magical realism." One of the assignments previously given in seventh grade English was having the students write a short story with elements of "magical realism," so I am eager to find some good mentor texts. This is certainly one. Carolina (Carol) has to spend the summer with her family, getting her grandfather's ranch ready to be sold so that he can be moved into an assisted living home, now that his dementia is progressing. She is curious about this grandpa she has never met, and his dementia serves as a gateway between the realism of much of the novel as it contrasts with the story he tells her about the ranch and its history. The story and its magical is-it-isn't-it-possible moments made me realize that Holes by Louis Sachar, Maybe a Fox by Kathi Appelt, and The Seventh Wish by Kate Messner could also fall into this "magical realism" category. Would love some more ideas to help build a text set around this for my middle school readers and writers. I've bought Thunder Boy but I've been holding off and saving it for just the right reading moment. Yuyi Morales might be my favorite PB illustrator (though it would be hard to choose just one--and thankfully no one is demanding that I do that!) so I have high expectations. Love Chris Barton, love Don Tate, so I'll definitely be ordering this book. Glad to hear it would connect well with a Passion Projects focus. I spied Hour of the Bees at a library last week. We were out of town, so I didn't check it out. Your review will have me looking for it at my own library. Thanks for the review! Hour of the Bees was so lovely, wasn't it? 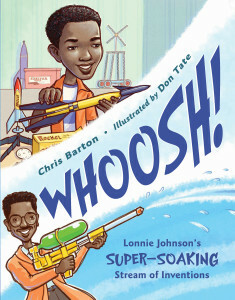 I totally need to get my hands on Whoosh! A note in Thunder Boy could be a good thing. I just loved the small boy's wonder about his place in the world (and the awesome illustrations) and the eventual joy in his connection with his Dad. But other readers could just see it as "different" if they had no knowledge of the culture (and I fully admit mine is surface, at best). Writers and editors do have an enormous responsibility in what they publish, and teachers and librarians in what they share with kids. Thanks for sharing Whooosh! We just had career day at my school and you've made me think that reading some books like this one may help students see how passions can be turned into a career. I added Thunder Boy, Jr. to my list, but Whoosh is not available in my library yet. I am dying to read The Hour of the Bees. I see it recommended so often. Thanks. Whoosh and Thunder Boy are both PBs I have on my soon TBR! I also want to read Hour of Bees, but it was checked out for the summer. 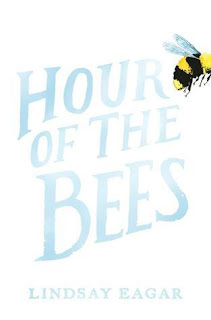 I loved Hour of the Bees. Magical realism is my favourite genre. I get all the controversy around Thinder Boy, but I think it's about a lot more than having an unusual name. Sherman Alexie is coming to town next week and I'm very excited about seeing him! How cool! Would love to hear how the visit goes.